Experience the flaky indulgence of an authentic hand-crafted croissant, or dip one of our incredible chocolate chip cookies in a tall glass of cold milk. Please note that we don’t make every single pastry every day of the year! Some of these are seasonal or rotate with other products. If you have your heart set on something, give us a call or send us an email and we’ll let you know if it’s available. To insure quality 48-hour notice is required for all pastry special orders. *Note these items rotate on a weekly-ish basis. Please call ahead for availability. 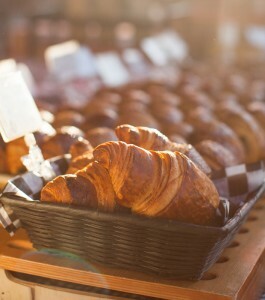 Our croissant and danish dough is made with 30% local whole wheat flour. follow us for fresh news! We would love to hear about your recent visit to Serious Delights!